Working from home is both a luxury and a curse. Sure, you don’t have to fight with traffic or even get dressed in the morning, but the line between home and work can begin to blur to the point where you’re not sure if you’re working from home or living at work. Additionally, it is much easier to get distracted when your office is part of your house. Kids, pets, phone, doorbell — these distractions can add up to sensory overload and prevent you from working productively. The key to overcoming this problem is to redesign and remodel your home workspace. With a few tips, you can have all the advantages of working at home and still achieve the level of productivity that comes with working in an office. You want your home office to be comfortable, but not so comfortable that you are inclined to take a nap. You want it to be welcoming, but not so welcoming that your kids set up camp in there with you. The design of the space should be infused with elements of your personality, including paintings, furniture and decor, but these elements should not detract from the functionality of the space. These elements should take up as little floor and leg space as possible. Keep items like floating shelves, fold away desks and chairs, and wall-mounted cabinets in mind when considering how to best use your limited space. You also want to make sure that your designated office or workspace is in an airy, well-lit domain in your home. An area with an existing heating and ventilation unit is ideal. However, if the only space available to you is in the basement, stock up on fans, an air purifier and a humidifier to counter the stagnant air. In an ideal home office, three kinds of light should be available: task lighting, ambient lighting and natural daylight. Task lighting is light you can shine directly on your work, so a desk lamp or flexible floor lamp is a good option. Use compact fluorescent, energy-efficient bulbs for your task lighting because they stay cool, last longer and are available in different watts and color variants to best suit your individual needs. For natural lighting, try to set up your workspace near a window. Natural lighting is the most effective (and the cheapest) of the recommended lighting types. Plus, being able to gaze out the window every so often as you work is good for the soul. Be sure to invest in some quality window treatments, though, to block out the distractions that the window might bring and also to monitor the temperature in the office area. A sheer curtain can also be implemented to create ambient lighting for performing tasks that do not require direct or natural light. When considering colors for your workspace, remember that some colors stimulate the brain more than others. Colors that are too dark or too vibrant may prove distracting or can even elicit anxiety. For the walls, choose a neutral color that is soothing in the warm months of the year and also warming in the cooler months. Shades like cream, lemon and pastel blue are smart choices. Too much noise can also be a stimulant and a distraction when trying to work from home. The kids yell, the dog barks, the television blares. Your workspace needs to block out these noiseswhile still allowing you to hear what’s important. A good rug or carpet can absorb some of the noise; however, you can also install panels on the wall or add sound-proofing mats for added absorption. Simply upgrading the insulation in the room and the air sealing can cut back on noise pollution significantly. 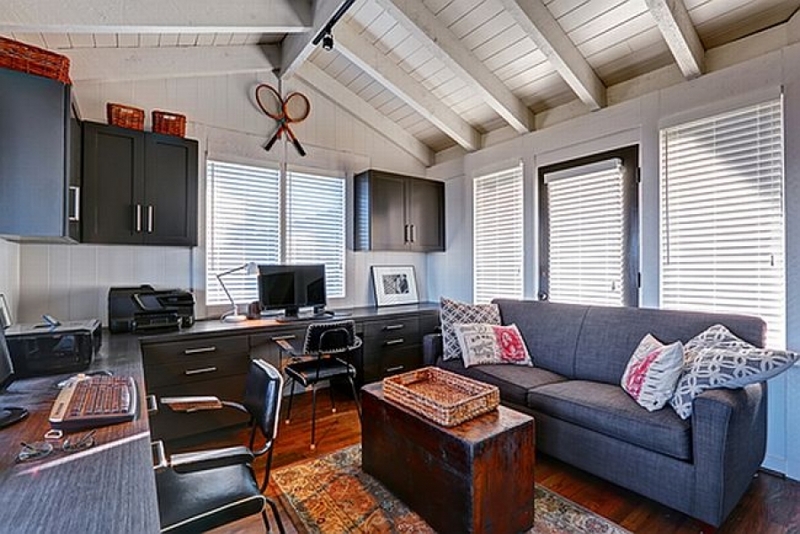 So, if home is where the heart and the office is, a few remodeling and designing tips can help you boost your productivity and better enjoy your home office.